A few months late, but finally here I am… The month of March brings with it several reasons to celebrate. It signals the end of the winter, in other words, it’s pure joy. But better than that, we got married in March… the 7th to be exact, and four short days later it’s my birthday! Some people don’t care about celebrating their birthday. I don’t “get” that. I am totally into it. So there you have it, March is a triple joy month. This year was our 15th wedding anniversary, which of course feels special, although at the risk of sounding a bit cheesy, each anniversary is very special to me. If we both had to pick a place to celebrate life the way we love it, Hawaii would be it. We love everything about it, the sun, being outside, playing golf in amazing courses, jogging along the coast. The North shore of Oahu is the closest spot to paradise for us. It has none of the commercial, touristic stuff of Waikiki, it’s a more pure and wild experience. So, that’s where we went to celebrate the date. It was a rather short visit, but we savored each moment. One of the cool things we did was performing a major exorcism. An explanation is obviously needed. When I was 13 years old I went for a trip with my older sister Nyrma and her husband. They arranged a horseback riding session for me (the first of my life), but unfortunately it did not have a happy ending. It was with a group of teenagers from the hotel, most of them quite comfortable riding. To make a long story short, one of the teenage boys, trying to show off, started galloping real fast, and startled my horse. All I remember is that my horse behaved like the one from Zorro, raised the front legs way up in the air, and took off like a maniac! Soon we were far away from the group, I was hugging the neck of the horse for dear life, but then my saddle started to slip sideways! At some point I was pretty much hanging to one side, almost parallel to the ground, with my head passing just above the roof of cars parked on the side of the street. Yeah, the horse decided to gallop through town. I heard people on the sideways screaming “somebody help her! that little girl will fall”… Keep in mind that at age 13 I looked more like a 9-year-old… (sigh). My crazy horse left town again, galloped some more, until he decided he’d had enough and stopped to munch on something by a tree. That’s when I finally fell off. Let’s say that experience traumatized me quite a bit, and even though I love all animals, horses make me a bit nervous. But I don’t like to sit on my fears. I’ve always wanted to turn the page and be able to ride a horse again. Thanks to Phil, I managed to finally go for it. But first things first… I had to keep my composure while getting close to the horses…. The instructor at the hotel made sure I got a very gentle horse (the thought of “famous last words” crossed my mind). We were a group of 6 riders plus the instructor. I got to ride right behind her, and Phil following behind me. Talk about feeling safe… It was perfect. 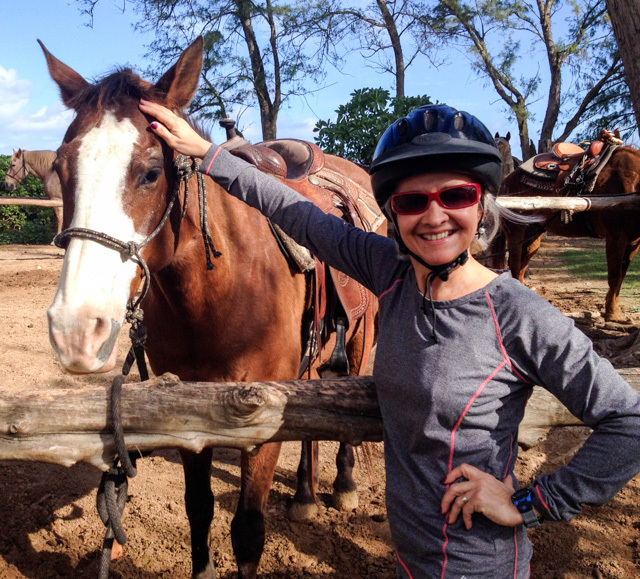 Midway through the ride, I was comfortable enough to pose for a photo… The ride was slow, nice, and peaceful. Could not ask for more. 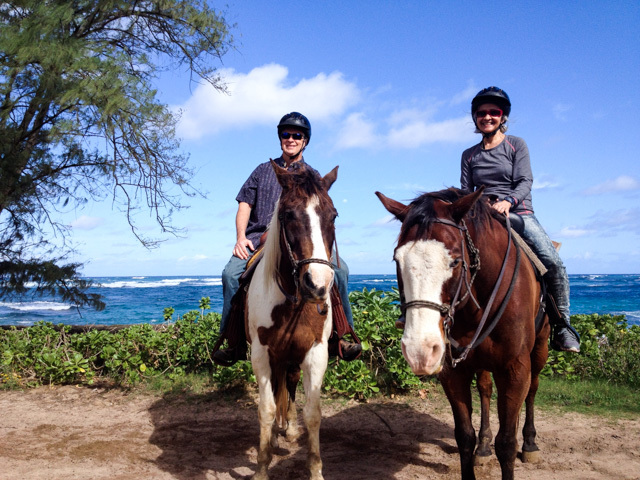 Full disclosure: Phil said that when I first climbed on the horse my face was as white as a Hawaiian cloud. Indeed, I toyed with the idea of jumping off and running back to the safety of our hotel room. But the horse was too tall and I did not want to risk breaking a leg or two. So I stayed up there, pretending all was fine. I’m glad I did. It felt great to overcome a major fear. Page turned. Next time, I want to go for a faster ride. HA! 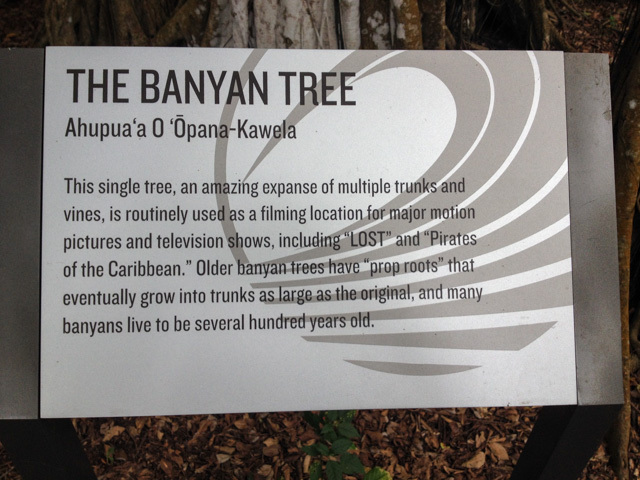 Another fun part of our trip was paying a visit to the famous Banyan Tree…. I had high hopes of seeing Jonny Depp around, but no luck with that. No worries, I had my private George Clooney with me at all times. The tree is nothing short of magnificent. Everything you see in the picture is part of a single tree, it actually covers a huge area! 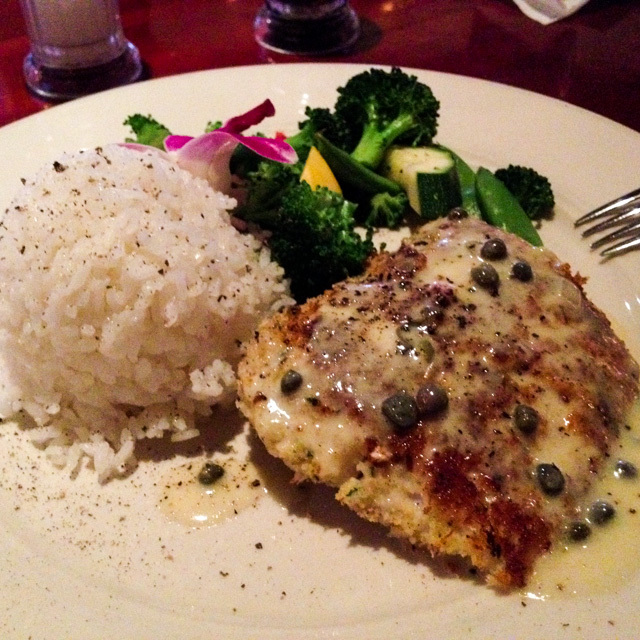 As usual, we enjoyed great meals, mainly seafood in all its glory! Aww happy anniversary!! You two are so adorable. Love it! So glad you conquered your horse fear. And congratulations – 15 is fabulous!!! Fifteen feels great – all grown up but still full of childish play…. The neighbor girl and my grandchildren ride Shorty. He would be perfect for reaffirming your exorcism. Congratulations on your 15th anniversary and your birthday. By the way, you looked amazing in that party dress. Conquering your horse fear is a wonderful accomplishment especially in such a beautiful location. 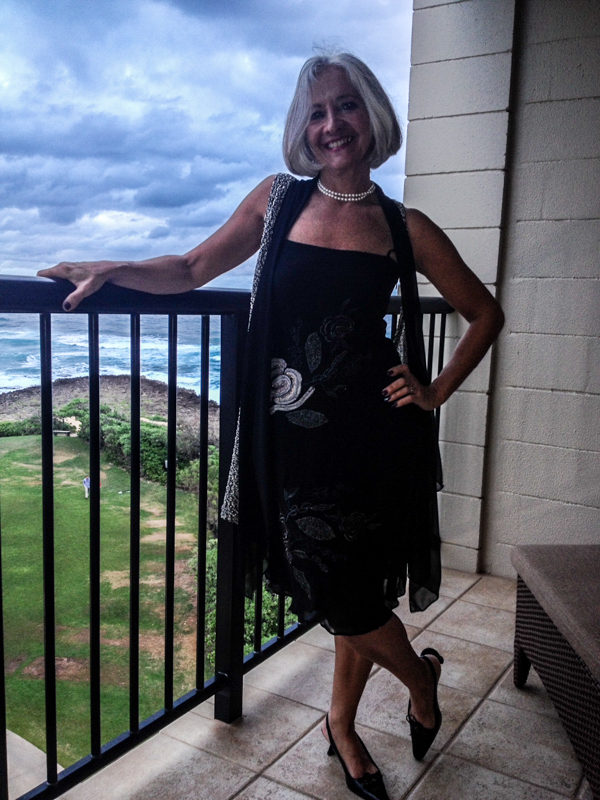 I used to travel to Oahu on business frequently. Many people ignore that island in favor of Maui. 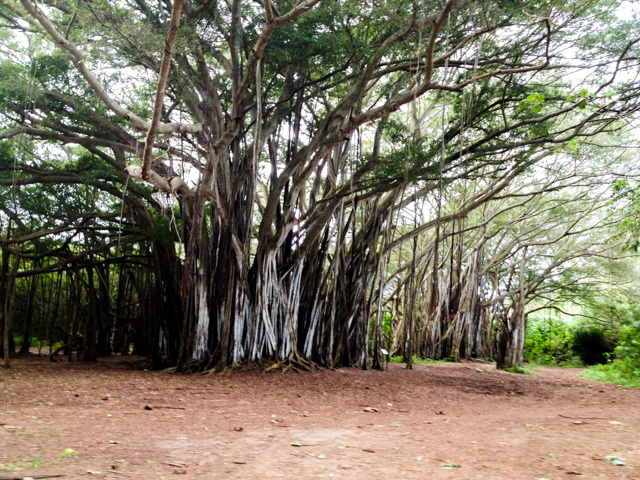 I was always fascinated by Oahu — lots of wonderful things packed into a pretty small place. And — you do great “glam” shots! 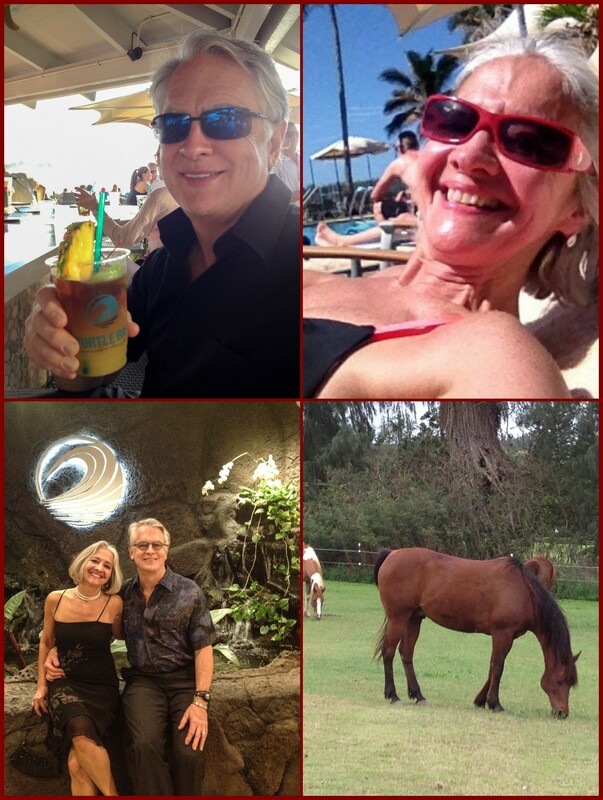 We went to Maui once, very nice too… but our hearts beat faster for the north shore of Oahu… we cannot get enough of it. One running route in particular is my number one favorite spot to jog. No other route comes close to it in beauty. Sunset Beach, Pipeline… WOW…. Hi Sally. Congrats on the B-Day and 15 years. 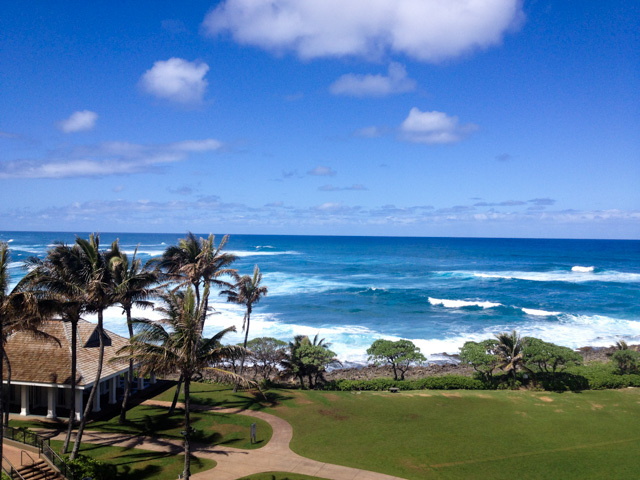 We love Turtle Bay and North Shore. Baby Lady’s sister lives in Honolulu so we go to Hawaii whenever we can. Not only do we love Oahu but we get to see Marta as well. Seeing Marta is probably the best part of the trip because we see her so seldom. We used to Stay at Ko’Olina but it has gotten overdeveloped with hotels, resorts and timeshares. While Waikiki is hustle, bustle and touristy, it’s close to Marta’s condo. Also, we dearly love Hanama Bay and it’s closer to Hanama Bay than Ko’Olina. 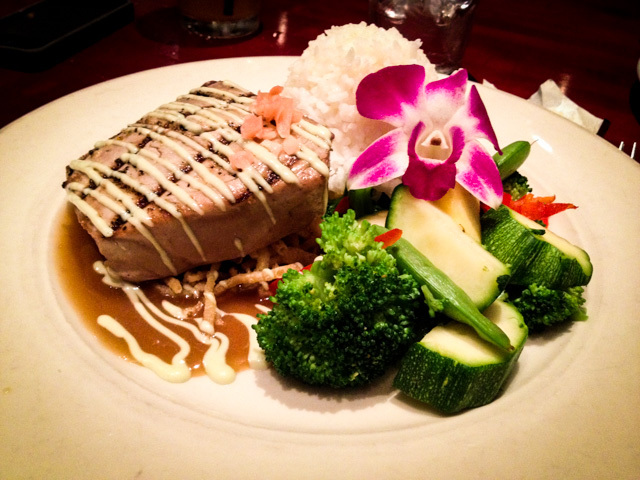 Have you tried Kawaii? It’s much more rural and undeveloped. The north shore is better there, as well. BTW-I love your wood sculpture. Do you remember where you got it??? We collect couples and I would love to find one like it. It’s fabulous!!! Mind? Mind? I LOVE IT!!!!! Your comment made my day, and trust me, this day has been absolutely perfect, so you see how much I love it that you bought one! it took me a while to choose that one, I wanted something that conveyed exactly how I feel, and… that was it. 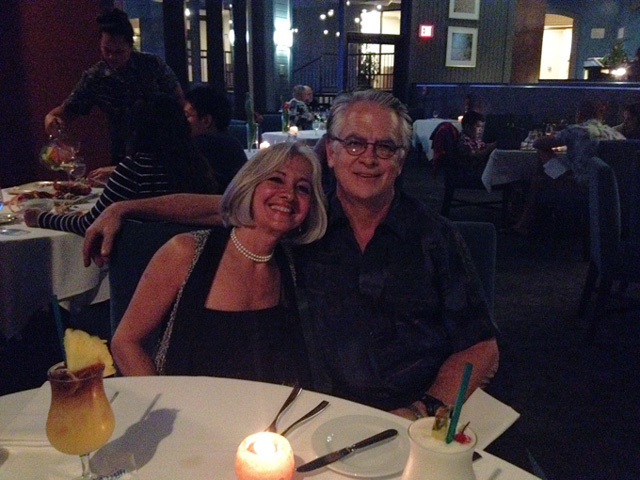 Thank you for the lovely story and pictures: have been at that banyan tree quite a few times. Naturally double congratulations are in transit even if a little late. The North Shore tends to be a wee bit too windy for me especially during Kona weather . . . I also feel you would thoroughly enjoy Kauai: my favourite ‘Sandwich Isle’, altho’ tourism with its ills seems to have ‘attacked’ that beautiful place since I was last there . . . and yes, I love that outfit also . . .
Congratulations on your anniversary and Happy belated Birthday. So glad you were able to enjoy horsebacking riding this time around. Great photos.